In the first article in this series on how to fix your bowling green, you started some investigative work to find out what the current situation is with your bowling green. This is the way that performance is improved on bowling greens or indeed in any field of work. We follow a process known as Now, Where, How. This recognises the fact that we can’t reach a projected level of performance without knowing where we are starting from. Beyond that we can’t achieve a performance green without being able to define what that actually is. Finally, even after defining the ideal situation, we can’t hope to reach that point without a plan. This is Now, Where, How in practice. Step 1 then, was about investigation and in addition to writing down the issues you have experienced on your green you dug out a few soil samples to back this information up with hard facts. The type of soil sample I recommended was like the one below and you should have taken several of these across the green, especially if you have distinctly different areas on your green. In the first article we discovered that although there are many potential problems on bowling greens, the majority of greens can be classified as being at some stage on the Circle of Decline. 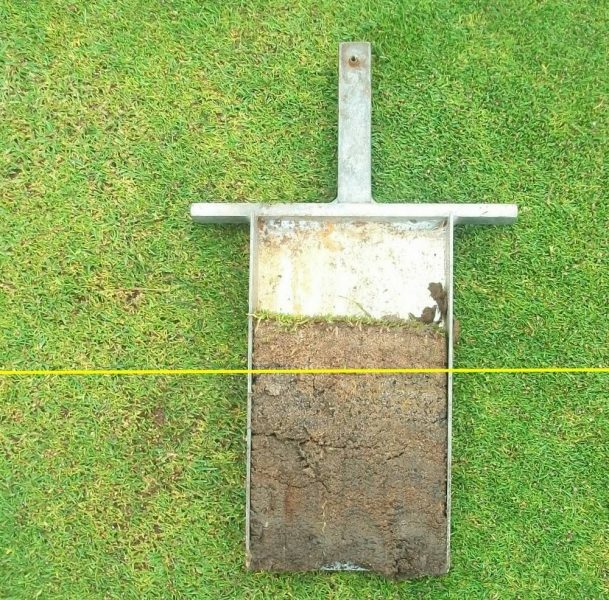 This is due to the fact that every single problem we find on greens is actually only a symptom of a very short list of potential underlying defects. By working on the root causes, we can quickly turn things around and start to make progress towards a consistently high performance bowling green. Remember, you can send me details of your specific problems, including photos by using the members Help! form. Let’s have a look at some of the issues that crop up regularly and that you might have noted from your own investigations. First of all, assuming that you managed to get at least one nice slice out of your green using a sampler (these are about £100 new and a good investment), or a border spade as a reasonable alternative. If the cost of a proper sampler is off putting, try speaking nicely to your local golf club greenkeeper, who might have an old hole cutter lying around un-used. This will give you a cylindrical profile sample that you can split down the middle with a knife. You should take a sample from any area that looks distinctly different and at least one from an area you would consider to be in good condition. 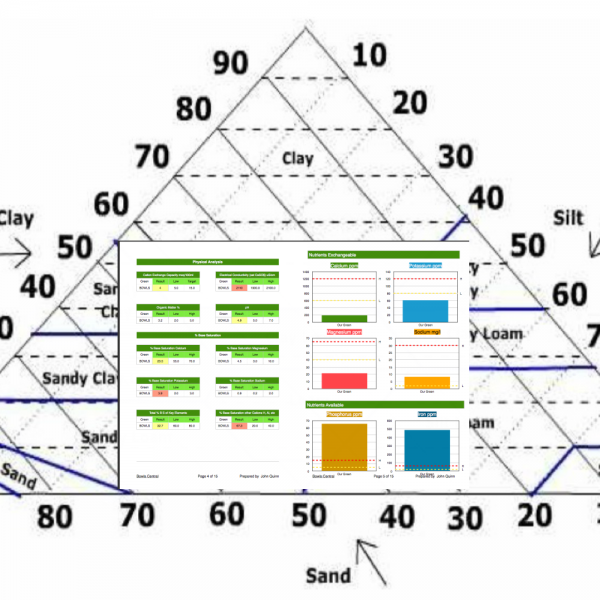 Have a look at the soil profile to see if there are any distinct layers. The soil should ideally look like one homogenous mass without distinct layers of different materials. 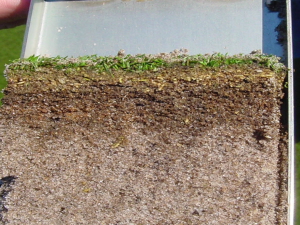 In most cases on bowling greens if you take a deep enough sample, you will see at least one distinct horizon (layer) change where the top 100-150mm is distinctly different in texture from the soil below. This marks what I’ve termed the improved horizon, which identifies the depth to which most of the regular maintenance has taken effect, especially aeration and top-dressing. This means that most greens will show a markedly sandier improved horizon than the soil below that level. You should be able to see (you might have to break the sample apart) evidence of root growth down through the profile. Root depth can be variable and although healthy turf will tend to have deeper roots, don’t worry if yours don’t go all the way to the bottom of the sample. You might see large masses of roots going down old core holes in your samples, proving that if we make it easier (by aerating to overcome compaction) for roots to get down, they will. 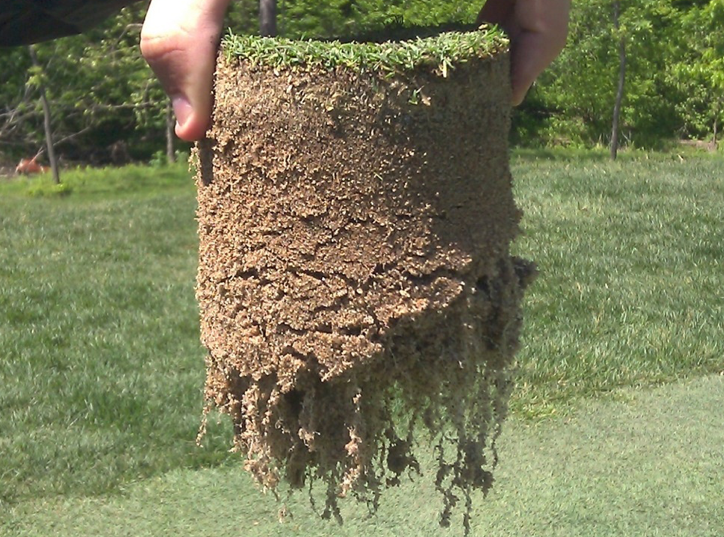 Deeper roots make for a more resilient turf due to the plants’ ability to obtain moisture from deeper in the soil. However, root depth is directly correlated with leaf tissue mass, so it’s common for roots to recede upwards as the grass is mown shorter. Root mass is important too. The soil should be held together with a great mass of tiny grass roots and if you break the sample apart you should see a high percentage of fresh, white roots which indicates that the plants are growing vigorously and producing new root growth. The first thing you will notice is thatch, which is the dense mat at the top of the sample directly under the grass or at least the bit where the grass should be! Thatch is made up of dead and dying grass roots, shoots and leaf tissue. Some thatch is essential to allow the turf to stay knitted together in a cohesive unit, but too much is bad news. 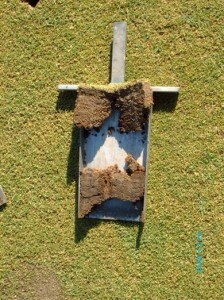 The optimum level of thatch is around 5-10mm and you should be concerned about it if is significantly more than this. 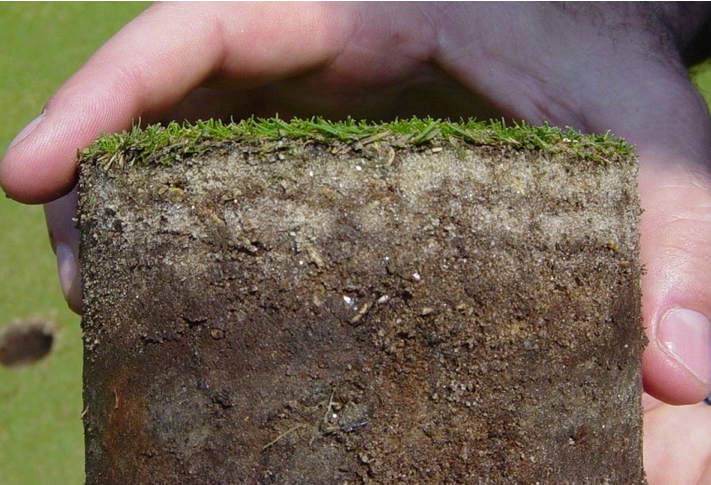 A thick thatch layer shows that the natural processes that recycle organic material into humus and soil nutrients aren’t working at capacity. On bowling greens this is commonly due to a lack of microlife in the soil. The thatch layer might be dense, wet and smelly and if it is, you can probably squeeze excess moisture out of it. In this case the green will be slow and unpredictable and susceptible to disease outbreaks. In dry weather the same thatch layer can become hard and dry and impermeable to water, causing the green to be bumpy and difficult to keep grass cover. Related to everything we’ve discussed so far is a condition known as Rootbreak. Root break is identified by the sample falling apart at a particular horizon in the profile. This can happen due to compaction or layering of different materials in the soil. Essentially it means that the roots have either stopped at a layer and have gone no deeper due to it being repellent (anaerobic or dry) or hard and impermeable. 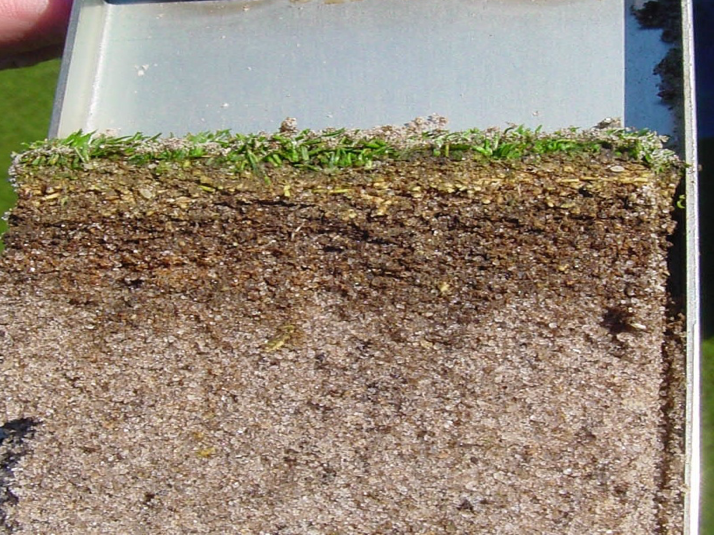 In a lot of cases where the thatch layer is thick, dense, wet and anaerobic a rootbreak will appear directly at the bottom of the thatch layer, meaning that all of the roots are existing within the thatch. 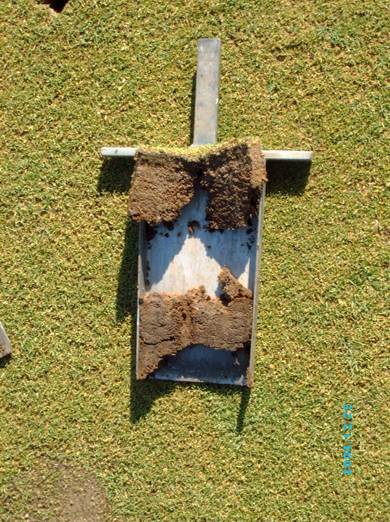 Rootbreak is common on greens that have been subjected to a variety of top-dressing materials over the years, or that have deep seated compaction leading to anaerobic (black) layers or that have built up a dense and anaerobic thatch layer. At this stage in the process it will be very helpful to have a soil chemical analysis carried out. It also makes sense to collect the required samples for this as you go. In many cases a soil analysis can help to identify the green’s tendency towards certain problems. The Base Saturation of your soil dictates the pH and Cation Exchange Capacity and these are critically important to the overall performance of your green. If you haven’t taken samples yet, please try to get it done soon, Remember you can send me details by using the HELP form! Next time we’ll look at some of the more visual pointers we can see on the turf surface. Happy digging.